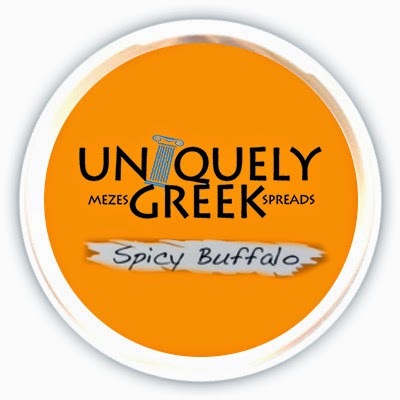 When I was asked to try Uniquely Greek Hand Crafted Feta Cheese Spreads, I jumped at the chance. There is a fantastic Greek restaurant in our town that serves a feta spread appetizer, and I always order it every time I visit the restaurant. My one friend loves it so much that she orders it to-go for all of her parties! And another one of my friends has tried to duplicate the recipe... with pretty good results! 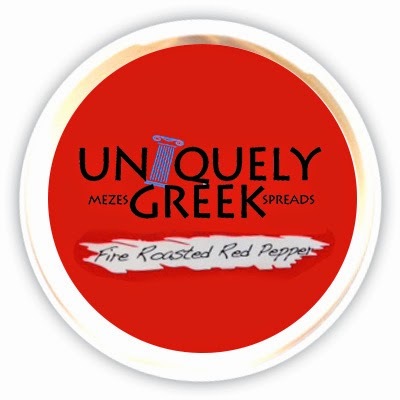 Summary: We start with only the finest red peppers, fire roast to perfection, then infuse with domestic feta, garlic and cream cheese to give an extra kick to any recipe. Tip: substitute our Fire Roasted Red Pepper Spread in any recipe that calls for low fat mayo or cream cheese to add a little zing! Summary: Is it the fresh spinach? Or could it be the feta and garlic? Maybe it's the perfect blend of each ingredient with cream cheese? We won’t spill our secret, but we will tell you that it's decadently delicious. 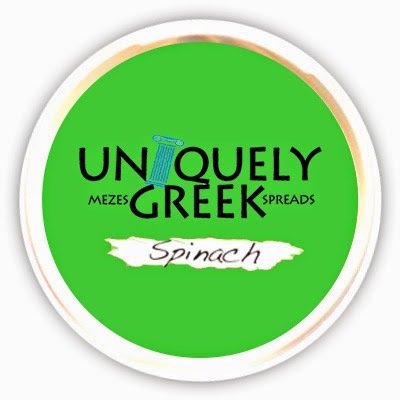 Eating our Simply Spinach Spread will make Popeye proud. Summary: This isn't your run-of-the-mill buffalo flavor you find at the local BBQ joint. We take the perfect amount of spices, add our signature feta cheese, blend together with only the finest cream cheese to make a spicy, yet flavorful spread. Keep enough Spicy Buffalo Spread on hand for your next get-together so you won't have to - dare we say - wing it. Summary: Why import Kalamata olives from Greece? 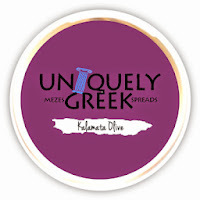 Because if we didn't, our Kalamata Olive Spread wouldn't have that authentic Greek flavor that everyone loves ... and quite frankly, it just wouldn’t taste so darn good either! 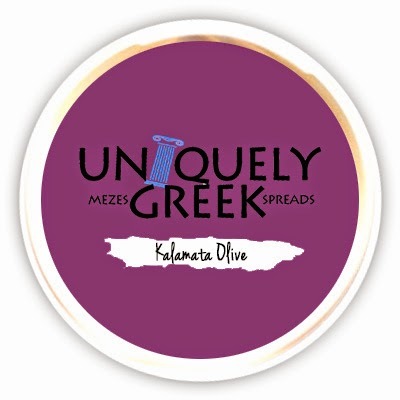 Kalamata olives infused with feta cheese, garlic and cream cheese ... some say it has a miraculous combination of flavors, we say it would be a sin not to try it. 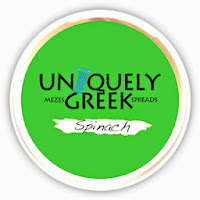 There are so many great things about Uniquely Greek spreads! The company was started by a brother/sister duo right here in Pennsylvania. You can read more about their story here. In addition, the ingredients are all-natural and have NO artificial flavors, colors, additives, preservatives or fillers. They are also gluten-free! While I have been using these spreads as dips, there are actually quite a few uses for them. Of course, I'd have to stop eating them out of the container to try them in some recipes. The Uniquely Greek website has some recipes which I'm dying to try including a Greek-Style Stuffed Chicken Breast and a Back-to-School Pasta Bake. There is also a Greek Six-Layer Party Dip that looks interesting. My only issue with Uniquely Greek Spreads is that I can't get them in a local store. The products are currently being carried by Whole Foods and MOMs as well as a few other places. I am desperately hoping that Wegmans soon carries them. In fact, I'm going to email them about it today. See how serious I am about these dips? In the meantime, I am just grateful that I can order them on-line and have them shipped directly to my house. If you can't tell, I am crazy about Uniquely Greek Spreads. Give them a try! You had me at Feta - boy do those sound good! I'll have to see if our Whole Foods carries them. Julie, these do sound very good! I wonder if they're available on the West Coast? Oh I sure wish we could get this here in central PA. I'll write to Wegman's too. These sound fantastic! I'll be doing some research to see if they will be coming to southern Wisconsin soon! I just reviewed these awesome Feta Cheese Spreads too! My favorite was the Spicy Buffalo, what about you?